Turbo to boost power of blue oval's hot hatch. The next generation of the Ford Focus RS hot hatch could produce close to 250kW via a 2.3-litre turbocharged four-cylinder engine from the company’s EcoBoost family, UK website Auto Express reports. And it appears likely Ford will continue to drive the expected 246kW through the front wheels, taming the extra power of the new engine via either the “Revoknuckle” technology it pioneered in the previous RS, or a Torque Steer Compensation system developed for the Focus ST. The previous Focus RS model came to Australia in limited numbers, offering a feisty 224kW via a turbocharged five-cylinder mill. Only 315 were delivered here with a tall $59,990 price tag, ensuring the car became an instant collector’s edition. 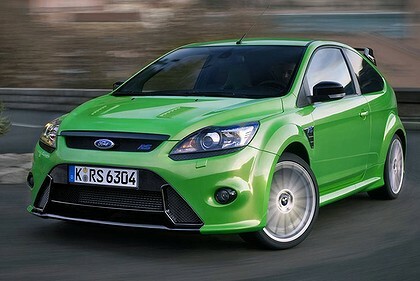 Ford Australia spokeswoman Sinead Phipps says the Focus RS is yet to be signed off globally for production. However, Auto Express reports that Ford’s global performance cars boss, Matthias Ton, has confirmed that a US-developed 2.3-litre turbocharged EcoBoost engine – which may also be destined to replace six-cylinder units in the hero Mustang performance car – is the most likely candidate for the job. Ton was speaking at the international media launch of the Focus ST, which is the nominal high-performance head of the Focus family - until the RS is signed off. The ST will use a turbocharged 2.0-litre EcoBoost engine to make a Volkswagen Scirocco R-rivalling 184kW and 360Nm when it arrives in Australian showrooms in October. Despite those impressive outputs, the ST adopts a comparatively mild appearance, leaving space for an RS model to add the likes of a racecar-like front spoiler and massive rear wing, plus track-style Recaro seats. Stiffer suspension and bigger brakes than the ST are also a given, with the Focus RS expected to arrive in the US by the end of next year. Phipps says there are “no current plans” for Ford Australia to import the Focus RS, given the model hasn’t received final production approval. The previous model arrived in Australia in 2010 just before the end of its global production run, with Ford Australia maintaining for years prior that it could not build a profitable business case for it. Ford Australia can't build a reputable business case for it, yet maintain selling falcons (still without any decent advertising campaign). Sixty grand for a little four-pot screamer bearing the blue oval. Yet last I read toyota's new 86, (which beat some top-of-the-line porsche according to motor magazine), is being sold off the showroom floor for $30,000. And ford wonders why its sales are declining. Overall lesson here; Make something competitive and (for lack of better term atm) new to the market, instead of a flash clone and charging more than a competitor's equivalent. All politics aside, it is an awesome machine - one of the only considerations is the price bracket it falls into - opens up the 'a lot of car for the money' range IMHO. And you're quite right uniacidz I'd somehow managed to forget even sports cars have base models. The EcoBoost Focus would be impressive if it offered AWD. Until then, I don't think it will get a serious look in the local market. If it offered AWD and I was looking for a new medium car, it would be on the shopping list for sure. Agreed it would be more competitive if AWD...but in saying that, it already out-handles the HSV Astra (see Nurburgring compo). It's great that they're addressing the torque-steer factor to make it more refined. Dunno if I'd go as far to label it a medium sized car - they're pretty small inside! In my opinion the falcons are fantastic already however I was reading an article at school today in motor magazine... A Lexus vs. G6E turbo vs. BMW. The falcon is lacking so much in technology, time to update!!! The Toyota 86 boxer engine has fairly high comp ratio-- not ideal for FI. The cost of turbo charging one would be quite high, compared to say, a standard or lower comp engine. I love the 86/BRZ as an idea, and 90% of it's execution. Its the engine that lets it down. An ST with 184kw would be a great daily drive as well as a weekend blaster. Would carry the groceries and the 2.5 kids no probs, so who the hell needs a falcon? Seriously though - in saying that, there is most certainly a market for these cars - considering the drop in new car sales across the spectrum...why not think outside the proverbial mainstream square and target the once-niche category of (pseudo?) sports cars but make it more versatile by tailoring it to the modern lifestyles of the 'average' 30-something or so. IIRC, some of the previous EVOs didn't even come with A/C! thnx for the tip but it doesnt bother me the slightest. just thought it would be fun to bring up. and speaking of which, i also work with another ben with the last name starting with d.